In 1876, a coach road was established between Drain and Scottsburg. Drain was the starting point for the Drain-Coos Bay stage line, which ran to Scottsburg and then by river steamer to Gardiner and the beach on the south side of the mouth of the Umpqua River. The Drain Normal School was founded in the community in 1883 by the Methodist Church. 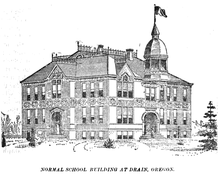 The state took over the school in 1885 and named it as the Central Oregon State Normal School, before it closed in June 1908. According to the United States Census Bureau, the city has a total area of 0.61 square miles (1.58 km2), all of it land. Drain is at the crossroads of Oregon Route 99 and Oregon Route 38, at a pass in the Coast Range, on the way west to the Pacific Ocean. Elk Creek and Pass Creek, both tributaries of the Umpqua River, converge in Drain. Pass Creek Bridge, a covered bridge in a park behind the Drain Civic Center, was formerly a road bridge. In 1987, the City moved the structure to the park and opened it to pedestrian traffic only. In 2014, the City completely closed the bridge, made unsafe by rotting support timbers. Drain, like most of western Oregon, has a Mediterranean climate (Köppen Csb) with dry summers featuring cool mornings and hot afternoons, and chilly, if not severe, wet winters. Occasionally during the winter a cold air mass from the interior will cross the Cascades to bring very cold weather and frost, although Drain gets very little snow with a mean of 1.7 inches or 0.043 metres, a monthly maximum of 21.9 inches (0.56 m) in January 1950, and a season maximum of 23.2 inches (0.59 m) in 1970/1971. The coldest month was January 1930 with a mean of 31.3 °F (−0.4 °C), whilst January 1949 with 31.9 °F (−0.1 °C) is the only other subfreezing month. The coldest temperature ever recorded in Drain is 0 °F (−17.8 °C) on January 22, 1962. Rainfall in winter is usually heavy: the wettest month on record is December 1955 which totalled 21.93 inches (557.0 mm), whilst the wettest "rain year" since 1903 has been from July 1973 to June 1974 with 71.08 inches (1,805.4 mm) and the driest from July 1976 to June 1977 with 23.76 inches (603.5 mm). The most precipitation in a single day has been 7.70 inches (195.6 mm) on January 18, 1951. During the summer months, days are usually hot and clear, whilst nights are pleasantly cool: in the summer of 2003 only 0.21 inches (5.3 mm) of rain fell over the three months, and in 1951 no measurable precipitation occurred for ninety-five days between May 24 and August 26. When a continental airflow occurs, the weather can become extremely hot: on July 31, 2015 a record 109 °F (42.8 °C) was recorded; however, the cool nights have allowed for frost-level temperatures as low as 31 °F (−0.6 °C) on June 10 of 1916 and 30 °F (−1.1 °C) on August 28 of 1905. As of the census of 2010, there were 1,151 people, 454 households, and 319 families residing in the city. The population density was 1,886.9 inhabitants per square mile (728.5/km2). There were 492 housing units at an average density of 806.6 per square mile (311.4/km2). The racial makeup of the city was 92.9% White, 0.2% African American, 2.7% Native American, 0.3% Asian, 1.0% from other races, and 3.0% from two or more races. Hispanic or Latino of any race were 4.4% of the population. There were 454 households of which 33.7% had children under the age of 18 living with them, 50.0% were married couples living together, 13.7% had a female householder with no husband present, 6.6% had a male householder with no wife present, and 29.7% were non-families. 22.9% of all households were made up of individuals and 9.5% had someone living alone who was 65 years of age or older. The average household size was 2.54 and the average family size was 2.95. The median age in the city was 39.5 years. 25.4% of residents were under the age of 18; 9.5% were between the ages of 18 and 24; 22.1% were from 25 to 44; 26.6% were from 45 to 64; and 16.4% were 65 years of age or older. The gender makeup of the city was 48.8% male and 51.2% female. As of the census of 2000, there were 1,021 people, 397 households, and 289 families residing in the city. The population density was 1,879.0 people per square mile (730.0/km²). There were 441 housing units at an average density of 811.6 per square mile (315.3/km²). The racial makeup of the city was 90.60% White, 0.10% African American, 2.64% Native American, 0.49% Asian, 0.29% Pacific Islander, 1.57% from other races, and 4.31% from two or more races. Hispanic or Latino of any race were 3.33% of the population. There were 397 households out of which 36.5% had children under the age of 18 living with them, 55.7% were married couples living together, 13.4% had a female householder with no husband present, and 27.0% were non-families. 22.9% of all households were made up of individuals and 9.6% had someone living alone who was 65 years of age or older. The average household size was 2.57 and the average family size was 3.02. In the city, the population was spread out with 26.7% under the age of 18, 8.8% from 18 to 24, 27.4% from 25 to 44, 23.8% from 45 to 64, and 13.2% who were 65 years of age or older. The median age was 38 years. For every 100 females, there were 96.3 males. For every 100 females age 18 and over, there were 86.5 males. The median income for a household in the city was $27,833, and the median income for a family was $34,231. Males had a median income of $30,278 versus $20,063 for females. The per capita income for the city was $13,810. About 8.6% of families and 10.3% of the population were below the poverty line, including 10.3% of those under age 18 and 7.0% of those age 65 or over. ^ "Drain, Oregon". Retrieved 2008-11-27. ^ a b Corning, Howard M. (1989). Dictionary of Oregon History. Portland, Oregon: Binfords & Mort Publishing. p. 76. ISBN 0832304492. ^ Guyer, R. J., Douglas County Chronicles – History from the Land of One Hundred Valleys, History Press (2013) ISBN 978-1609497651 at pages 44–45. ^ Pettit, Daniel K. (2016). "Pass Creek Covered Bridge". The Oregon Encyclopedia. Portland State University and the Oregon Historical Society. Retrieved March 26, 2016. ^ "NowData - NOAA Online Weather Data". National Oceanic and Atmospheric Administration. Retrieved 2012-03-23. Wikimedia Commons has media related to Drain, Oregon.